No one can resist Patisserie Rhubarbe | Everything Delicious. There are things in life that are irresistible, and deserts from Patisserie Rhubarbe are definitely one of those! 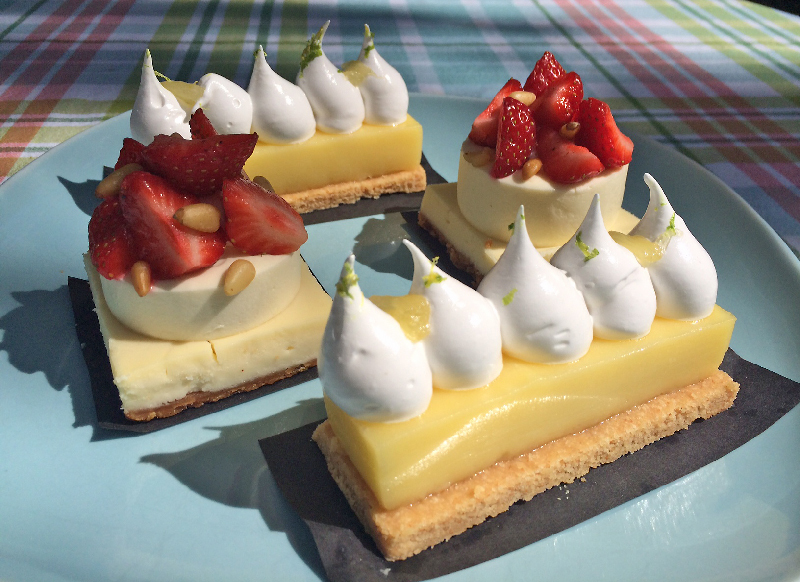 In any case, here is what I got at Patisserie Rhubarbe last week end: lemon pies and cheese cakes. Heavenly delicious summer treats. The pastry shop offers all sorts of individual size pastries (eclair, mille feuille, tartes etc. ), they also have full size cakes (which I would recommend you order in advance) and they serve brunch on Sundays…. The individual pastries are 4-5$ a piece and the entire cakes 20-35$ so a bit pricey but let me tell you this is well worth it. Ready to awaken your senses? Check it out. Pingback: Will G&G pastries win over your New Year’s resolutions? | Everything Delicious. Pingback: Elegant brunch at Patisserie Rhubarbe | Everything Delicious. This entry was posted on August 25, 2015 by Pauline Rosen in Shops feed and tagged cheese cake, deserts, lemon pie, pastry, rhubarb, sweet.